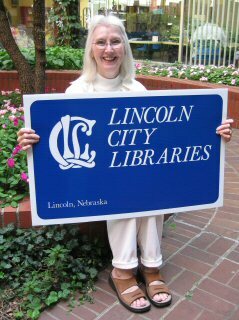 Reviewer Profile – Rianne S.
I have lived in Lincoln all my life, except for one year spent in Bloomington, Indiana where I attended library school. I remember sitting in my pint-sized rocking chair reading little golden books when I was four or five. I enjoyed fairy tales and The Little Engine That Could. When I was older, Caps for Sale was a favorite. Then came Trixie Belden and Nancy Drew. I really can’t remember NOT being a reader. I discovered Tolkien in college. There is so much depth to his work. I try to read The Hobbit and the trilogy annually — and I always find something new. Another favorite is Pride and Prejudice by Jane Austen. I almost go into withdrawal if I don’t have something to read. For non-fiction I rely on the bibligraphies at the end of books. I am a cataloger here at BMPL, so I see many new titles as they come through and I jot down lots of titles. I glance at book reviews in the newspaper and I also get ideas from Book TV. I use subject headings from the catalog. I find titles when I’m googling for something; quite often a hit is a book. Since I am a voracious reader I really have to rely on just about every source that I can. I firmly believe in not finishing a book if it doesn’t lure me in after so many pages. (I give the book 10% of the total.) So, I go through just bunches of titles. I like sharing with others. I especially get a kick out of sharing older titles. Reviewing is also a disciplined art: entice the reader without being too wordy. I enjoy that challenge. I re-read my favorites occaisonally — it’s like visiting an old friend and most of the time I’m not disappointed. Art Buchwald. He was a political humorist, who wrote short columns for his newspaper. His heyday was the 60s and 70s and many of his columns still have relevance today. The articles are both short and funny: a great combination.